Summit convener Toyin Umesiri (left) interviews Donnie Smith (center-left), former CEO of Tyson; Scott Ford (center-right), CEO of Westrock Coffee; and Dale Dawson (right), founder of Bridge2Rwanda during the investors panel at the Trade With Africa Business Summit. “Professional and key leaders committed to African development gave great insight into doing business in Africa,” he said. Many of the speakers and experts were met with applause during their presentations as they told engaging stories of success or elaborated on strategies proven to make a positive difference in creating sustainable business solutions in Africa. Scott Ford, CEO of Westrock Coffee gave the keynote address sharing the story behind the creation of Westrock Coffee and Rwanda Trading Company. Ford oriented his business venture around the idea of paying farmer the greatest amount of money for their labor to help elevate them out of poverty. Denise Thomas, Director of Africa and Middle East Trade for the World Trade Center Arkansas interviews Shakira Motan, trade commissioner for the Consulate of South Africa in Chicago and Kayode Laro, Consul General of Nigeria in Atlanta. Ford also served as an advisor to Rwandan President Paul Kagame to help create a positive business environment in the country. Ford strongly stressed that three principle ingredients were required for successful economic development in Africa: no corruption, the rule of law equally applied to all and the right regulatory and tax environment. Ford’s keynote was followed by general sessions led by Donnie Smith, founder of the African Sustainable Agriculture Project (ASAP) and former CEO of Tyson Foods as well as Dale Dawson the founder of Bridge2Rwanda. Smith created ASAP to teach Africans sustainable farming practices and allows farmers to finance small chicken coops over a three years period, interest free. ASAP currently runs a feed mill and a 10,000 hen table-egg farm and will soon have a hatchery to supply better quality chickens for the growers. ASAP has already demonstrated an ability to raise the standard of living for farmers. The ultimate goal is to spread sustainable agriculture practices to counter food scarcity before Africa’s population doubles in 2050. “My mission is now to foster sustainable farming practices across the continent so that families can break the cycle of poverty and feed future generations,” Smith said. Dawson launched Bridge2Rwanda to build a fellowship of globally educated leaders in Africa. It helps top high school graduates earn scholarships to study abroad, while ensuring the students return to Africa to launch their careers. The program is designed to fight the brain drain phenomena in which highly skilled, educated and intelligent people emigrate away from their home country and settle in another. Brain drain can inhibit economic development because it leads to a lack of talent and a smaller skilled workforce. Bridge2Rwanda operates on four principles to encourage foreign direct investment by developing the country’s best students into future Rwandan leaders: identify promising individuals; prepare them spiritually and academically; connect them with scholarship, internship and employment opportunities; and ultimately encourage them to create new businesses, technology and infrastructure in Rwanda to increase economic prosperity. “We believe a small group of committed servant leaders with a shared vision can be a powerful force to transform their countries,” Dawson said. Many participants at the summit were highly interested in Smith’s, Ford’s and Dawson’s models for sustainable business. “Our hope is that the summit participants will use the insight from these leaders and adopt similar practices in their home countries,” Thomas said. 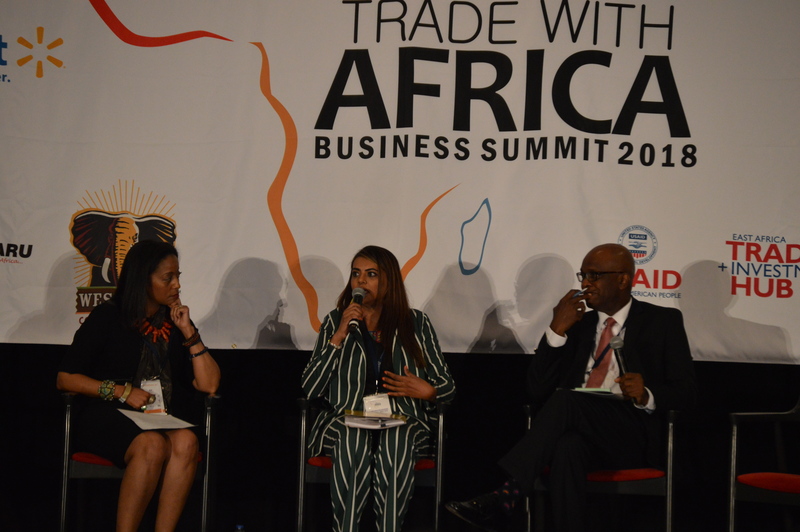 For more information about the Trade with Africa Business Summit, visit http://www.tradewithafricabusinesssummit.com or contact Toyin Umesiri at toyin@nazaru.com or call 989-400-6711.